Only the Dodge Manufacturer can offer "Bumper to Bumper" coverage!!! "Bumper to Bumper" (from the manufacturer) covers EVERY electrical and mechanical part on your vehicle, including cosmetics, vinyl, leather, upholstery, rust, paint, paint oxidation, corrosion, emissions, and the exhaust system. Any internet website or salesperson stating that their agreements are "Bumper to Bumper" are misrepresenting their coverage!!! This is the most comprehensive Service Agreement that you can purchase for your Dodge. Since there are so many parts on a Dodge, they can only list what is excluded. All parts on the vehicle not listed in the exclusions, are covered. Hence the phrase "Exclusionary." We offer Exclusionary Coverage for most vehicles 20 years old or newer with less than 60,000 Miles on the Odometer. Most of the Auto Warranties for New & Used Vehicles found at many Dealerships, Credit Unions or on Internet Websites are called "Listed Component" agreements. They only "List What is Covered". All of the other parts on your Dodge Not Listed in the Agreement are Excluded, hence the lower cost. Our Agreements Start on the Purchase Date of the Contract, not the Original Purchase Date of the Vehicle (like at the Dealerships). DO NOT BE FOOLED BY LOWER PRICING AND INFERIOR COVERAGE! You need to COMPARE contracts when shopping for a Service Agreement. For a proper comparison you should get actual copies of the contracts (not brochures, as they are vague). If the verbiage on the contract states, "We provide coverage for the following components", it is a "Listed Component" agreement, and not an "Exclusionary" one. All new vehicles sold in America come with at least two auto warranties, and many include roadside assistance coverage. Described below are the major types of warranties and assistance provided to consumers. Basic: Your basic Dodge warranty covers everything except items subject to wear and tear, such as oil filters, wiper blades, and the like. Tires and batteries often have their own warranty coverage, which will be outlined in your owner's manual. Emissions equipment is required to be covered for two years or 24,000 miles by the federal government and 8 years and 80,000 on certain components. Drivetrain: Drivetrain warranties take care of most of the parts that make your Dodge move, like the engine, transmission, drive axles and driveshaft. Like the basic auto warranty, parts subject to wear and tear like hoses and belts are not covered. However, most of the internal parts of the engine, such as the pistons and bearings, which are subject to wear and tear, are covered by the drivetrain warranty. See your owner's manual or local dealer for specific coverage. Rust or Corrosion: A rust or corrosion warranty protects you from rust-through problems with the sheetmetal. Surface rust doesn't count. The rust must make a hole to be covered. Keep your Dodge washed and waxed, and rust shouldn't be a problem. Roadside Assistance: Most manufacturers provide a service that will rescue you if your Dodge leaves you stranded, even if it's your fault. Lock yourself out of the car? Somebody will come and open it up. Run out of gas? Somebody will deliver some fuel. Flat tire? Somebody will change it for you. See your Dodge owner's manual for details, or ask the dealer about specifics. You've seen it happen time and again. A new business launches with a prosperous bang and high expectations, only to collapse mere months later with a bankrupt whimper. A marriage begins with intimate glances and fervent I love yous, but quickly devolves into icy glares and loud, angry talk of divorce. Clearly, situations that start out swimmingly can sometimes end in an unfortunate, premature way. But that doesn't have to be the case when it comes to the relationship between you and your car; there's an auto warranty designed to help that situation live up to your expectations. It's called an extended warranty, and it can help make sure that your car doesn't degenerate from prized possession to cumbersome money pit. In essence, an extended warranty is an insurance policy on your Dodge, a safeguard against expensive, unforeseen repairs. The term extended warranty is actually a misnomer, since, in the strictest sense of the word, these aren't warranties at all. Like auto warranties, they cover repairs and/or regular maintenance for an agreed-upon period of time. True warranties, though, are included in the price of the product; extended auto warranties are really service contracts, since they cost extra and are sold separately. An extended warranty may be purchased at the time you buy your Dodge; it's also possible to purchase one much further along in your ownership experience. If you're the type who likes to be prepared for all eventualities, an extended auto warranty may be just what you're looking for. Bearing in mind the ever-increasing cost of vehicle repairs, these service contracts can make a lot of sense. To what extent is your Dodge already under warranty, and is this coverage in sync with how long you anticipate owning it? If the car you've just bought is new, take a close look at its factory warranty before making an extended warranty decision. If, for example, the vehicle has a factory warranty of three years or 36,000 miles, and you plan on keeping it for two or three years -- with an anticipated annual mileage of about 10,000 -- then an extended warranty makes little sense, since you'll likely be covered under the manufacturer's plan. However, if you plan on keeping the car long after the factory warranty expires, an extended auto warranty is worth considering. If the car you've just purchased is used, you'll need to ascertain if there is warranty coverage from the dealership (coverage periods may range from as little as a month to up to a year, or more). If you're buying a late-model used vehicle, it's possible that the vehicle's original factory warranty is still in effect (this will be dependent on how many miles the car has under its tires, and on how much time has passed since it was originally titled). Some manufacturers also offer "certified used" programs that extend original factory warranty terms on pre-owned vehicles. If the car isn't under warranty, or if you plan on keeping it past its warranty's expiration, an extended warranty makes sense. What's the reliability record of the model you're purchasing? Take a look at the reliability history of the model you're buying. Though this is by no means a fail-safe way of predicting what your repair bill will look like, it does give you an idea of what you may be in for service-wise; bear this information in mind when making a warranty decision. What's the nature of its deductible? Fully investigate a policy's deductible before signing on the dotted line. Consider not only its amount, but also whether it's per visit or per repair. With a per visit deductible, each visit to the shop will run you a fixed amount, regardless of how many parts are repaired; a per repair deductible applies to each serviced part. What sounds like a minor difference may, under certain circumstances, have a major impact on your wallet. If, for example, you've got a $100 per repair deductible and you take your Dodge in to get the air conditioner, fuel pump and alternator serviced, you'll be out $300; had you opted for a per visit deductible, those repairs would only have cost you $100. Charier still is a $0 deductible policy. You will have to pay extra for this, but if your circumstances become such that you have to take your Dodge in frequently, you'll find that this policy more than pays for itself. Is the warranty transferable? Some extended warranties end when the person who bought the warranty sells the car. A warranty that allows you to transfer it to a new buyer is preferable; it's an excellent selling point for prospective buyers. Can repairs be performed at any repair shop? Some extended auto warranties stipulate that repairs must be performed at the dealership from which the warranty was purchased; this can prove limiting and inconvenient. It's best to opt for a warranty that, at the very least, gives you more than one service facility to choose from. You'll appreciate this should the vehicle ever need service while you're on a road trip, miles away from home. What exactly is covered? Know what's covered -- and what's not covered -- by the extended warranty you're considering. Does the service contract cover breakdown as well as wear and tear? Under a "breakdown" warranty, coverage is extended only to parts that break. Such a policy can prove less inclusive than is desirable, since not all parts fail due to breakage. Some need to be replaced because they've worn down over a period of time; a wear-and-tear warranty extends coverage to worn-down parts in need of replacement. Additionally, some "entry level" contracts don't cover ABS brakes, so if your Dodge has this feature, you should consider upgrading to this level. And overheating -- regardless of its cause -- isn't covered in many warranties. Thus, if overheating occurred due to problems with an expensive part such as your radiator, you'd be stuck with a hefty repair bill. Before committing to a warranty, take the time to fully explore the ins and outs of its coverage implications. The distinctions between the various plans might seem slight, but they can prove quite important. Is a cash layout required for repairs? Some extended warranties require that you pay the bill, then send the receipt in and wait for reimbursement; in many cases, months elapse before you get your money back. 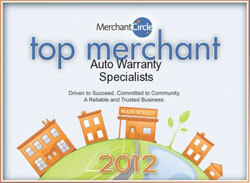 Ideally, you'll want a warranty that pays the dealership directly with a credit card. Remember to compare all your options before making a warranty decision. Utilize the Internet; many companies sell directly online, and, at the very least, getting quotes from them can help give you a ballpark idea of what an extended warranty with your desired features should cost. In warranty buying, as in so many other aspects of life, it helps to be fully informed.